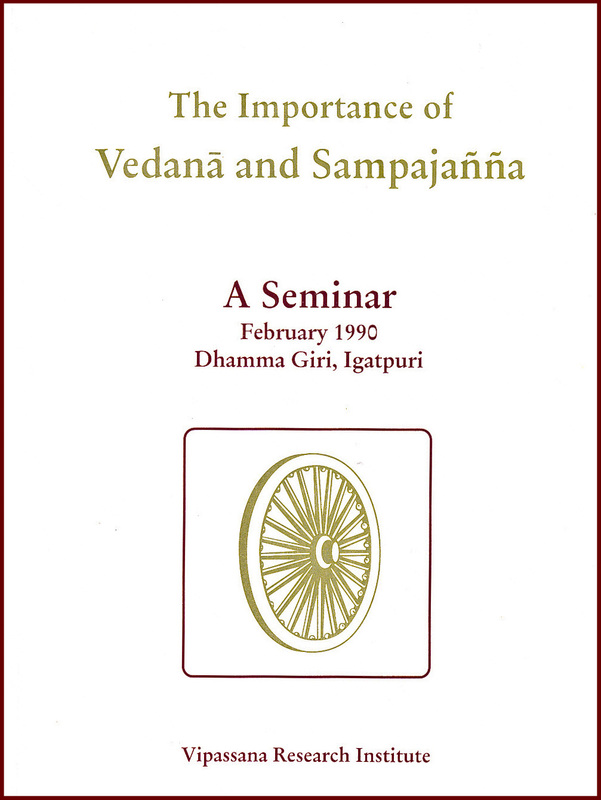 The Seminar on Vedanā and Sampajanna, held in 1990 at Dhamma Giri, Igatpuri, India, was an important milestone in the acknowledgment of Vipassana meditation as the quintessence of the Buddha's teaching. The papers presented at the seminar gave detailed insight into these two very important terms from the Pāli canon. They are inspiring to meditators and intriguing to scholars interested in the Buddha's teaching. In this second edition S.N. Goenka has contributed a new article that once again stresses the importance of vedanā (body sensations) in the practice of Vipassana and the understanding of Satipaṭṭhāna Sutta and many other passages from the Pāli Tipiṭaka. A necessity for any meditator! Very helpful info for new and seasoned Vipassana meditators. This work is singular in the field of vipassana meditation. It is a significant contribution to our understanding of how vipassana meditation utilizing vedana effects its change in us. This work is important enough that it should be better known and more widely read than it is. It is an in-depth analysis and scholarly look at texts that discuss vipassana meditation utilizing vedana, as well as a logical working out of its implications and discussions at the experiential level of how this sort of meditation can liberate a person. I know of no other text that is so focused on this one important subject and the insight and discussion on how this type of vipassana can break our old habit patterns of reaction to craving is invaluable. Every student of the Buddha and every practitioner of vipassana should read this insightful work (not just those those who follow Goenkaji). This Second Edition of seminar talks, essays, and research articles was updated to focus even better on two important Pali terms that are essential to understanding the practice of Vipassana Meditation: vedana, body sensations, and sampajanna, the constant, thorough understanding of impermanence which is realized by the objective, equanamous observation of vedana as they arise and pass away. The Buddha observed that vedana was the missing link where mind and body intersect, and this thorough understanding was the path of wisdom that illuminated the way out of suffering. In this Second Edition, Goenkaji again wanted to stress the importance of vedana in practicing Vipassana Meditation. To help with this, VRI (Vipassana Research Institute, adjacent to Dhamma Giri), an organization for conducting research into the theory of the Buddha’s teachings as found in the Pali Canon and practiced in Vipassana Meditation, refined the commentary. The first half of this edition contains articles by VRI that give in-depth examinations of vedana and sampajanna, including some new ones. Essays and talks in the First Edition that did not deal directly with vedana and sampajanna were excluded. I tend to evaluate the articles in the first half as 5 stars. The last half of the book has papers by participants from various countries at the seminar (and 10-day course) who range from Vipassana teachers, university professors, monks, learned laymen, serious meditators, to “a novice.” I tend to evaluate this section as 4 stars. Not that some essays are good and others not so good, but each reader will relate well with some essays and not as well with others, mainly because each reader has unique experiences from his/her own practice and study that help them relate and understand. These VRI articles and seminar essays provide excellent perspectives for meditators and scholars to better understand why vedana is the link in the chain of the Law of Dependent Origination that the Buddha discovered and cut with wisdom; a teaching that now allows meditators to come out of suffering and find liberation.